I began my work by looking through some of the amazing works that are held in the School Of Art Archives. I found some incredible handwriting patterns that had been produced by a teacher named Marion Richardson, who trained at Birmingham School of Art. The patterns that I had come across were from a book called Writing and Writing Patterns - one of a series of pamphlets that were published in 1935 by the University of London Press. 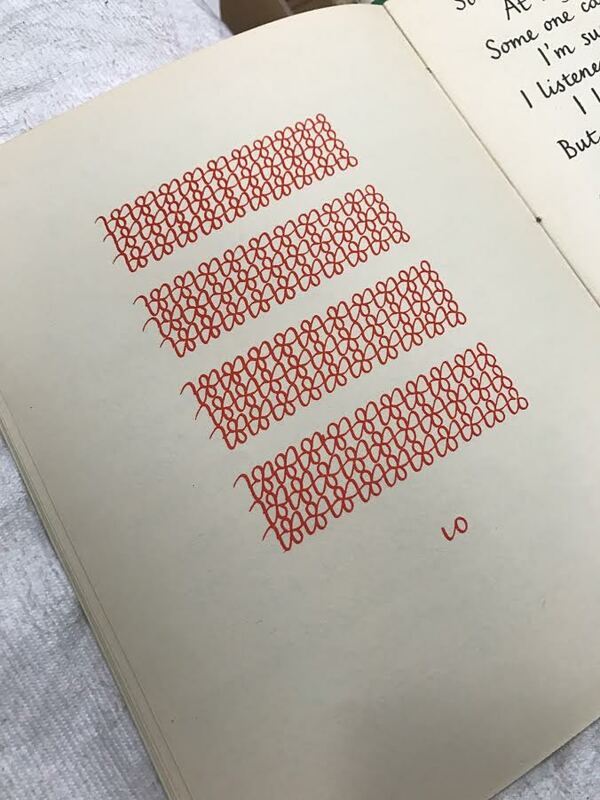 These patterns were designed by Richardson as she deemed them a successful method of teaching children about writing and the different patterns it creates. She would have written all of the text out herself and then had it reproduced as published copies. There are five versions of this book, all getting more and more advanced. There is also a book in the archives used as an aid to help teachers mark the work accurately. I found these patterns so accurately illustrated and intricate in detail that it made me feel rather sad for them being hidden away in the archive. I decided to create a piece of work that would not only reflect the old School of Art in some way, but also bring these patterns back to life and make them visible in the way that they deserve to be. When researching the Birmingham School of Art I thought about the building itself, as it is now and what it would have been like: the walls, floors, ceilings, windows, etc. The floors of the school particularly interested me as they are varied throughout the building - some glass, some wood, some ceramic - and in different forms too, like tiling. Hannah Elliott, Tiles inspired by Marion Richardson's writing patterns, 2017. I started by outlining some of the writing patterns on Adobe Illustrator and began to think about etching them into some kind of material to make a floor piece. I experimented with different materials, such as: acrylic, MDF and Lino. However, after trying each material, MDF seemed to be the most effective - not only in showing the pattern but also in reflecting the floor as it would have been in the School in 1935. I decided to varnish my tiles to make them darker in colour and give them more depth before displaying them on the floor of room G04 in the building. I hope that my tiles have done Marion Richardson’s writing patterns justice and succeeded in reflecting the old school too. It has been a pleasure to work with the archives at Parkside.